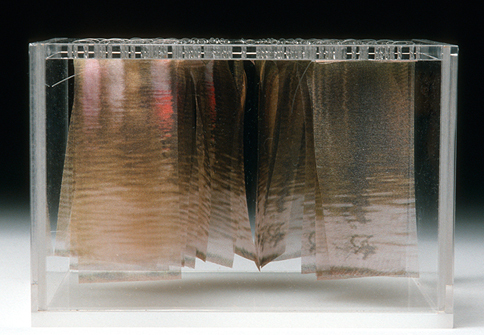 Katherine Crone’s piece ( shown above) measures only 4″ x 6″ x 4″. It is part of the Textile Study Group of New York’s “Economies of Scale” exhibition, which will open next Wednesday, January 7, at the Phoenix Gallery, 210 Eleventh Ave. @ 25th St, NYC. The members’ fiber pieces on display were created using diverse materials, techniques, and styles, but conform to a 6-inch-in-any-dimension size limit. The exhibition was juried by Lewis Knauss, artist, and professor at Moore College of Art & Design, Philadelphia. For more information about the group, the exhibition, and the catalog, scroll down to the Textile Study Group’s link at the bottom of this page, and go to the exhibition page.